The Miller Gallery lends the Pittsburgh Biennial a collaborative edge. To see Transformazium's work is to imagine not these bricks, but the ideas, hopes and dreams of Braddock's residents as worthwhile. Photo courtesy of Miller Gallery at Carnegie Mellon University. Brick by brick: detail of the Transformazium installation at the Miller Gallery's Pittsburgh Biennial. In a video projected on a half-finished corner of brick wall, Dana Bishop-Root talks about demolition. Demolition, she argues, is a process of raw destruction -- of ripping apart neighborhoods and tossing them into landfills. Bishop-Root, her neighbors and her colleagues in the Transformazium -- a Braddock-based collective of artists working in community and social change as art -- ply a different medium. In the deconstruction of a building in Braddock, Transformazium finds a different way to look at a structure's end. "Imagine growing up in a neighborhood where everything is constantly being destroyed," says Bishop-Root. Deconstruction, by contrast, shows that things typically taken to the landfill actually have value. 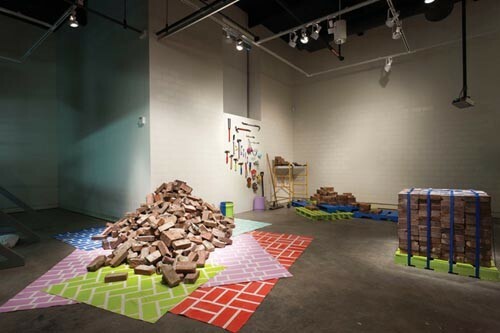 The physical results of deconstruction, in the form of both documentation (the video, activity sheets, a pamphlet) and objects (tools, bricks), comprise Transformazium's installation in the Miller Gallery's leg of the Pittsburgh Biennial. But to truly see this work requires one both to take in these mere things and to imagine the viral spread of an idea: the transformation of demolition into deconstruction; the re-imagining of a long-distraught former mill town as a place where every brick, every stretch of concrete, has intrinsic value. To see Transformazium's work is to imagine not these bricks, but the ideas, hopes and dreams of Braddock's residents as worthwhile. This kind of deconstruction -- of social ills, of long-held yet destructive beliefs, of the shadow walls that hamper our culture -- is at the heart of the Miller Gallery's Biennial. This year, the Miller hosts the Biennial along with the Carnegie Museum of Art, The Andy Warhol Museum and Pittsburgh Filmmakers/Pittsburgh Center for the Arts. But in this multi-lensed vision of Pittsburgh's art scene, perhaps no facet has been as ambitious as the Miller show, curated by gallery director Astria Suparak. Comprised of work by five teams of artists, the show focuses on groups approaching social issues, community life and transformation through art-initiated criticism. The artists of Transformazium --Bishop-Root, Ruthie Stringer, Leslie Stem and Caledonia Curry -- go beyond documenting their work. They've also moved part of their practice into the gallery, where they're holding brick-cleaning sessions, with educational and do-it-yourself deconstruction materials available to visitors. Similarly, the group Temporary Services (Marc Fisher, Salem Collo-Julin and Brett Bloom) presents "Self-Reliance Library," a collection of out-of-print books both iconic (the Whole Earth catalog, Buckminster Fuller) and not-as-much (Nomadic Furniture volumes 1 and 2). Surrounding this is "Personal Plastic," a series of quotes and slogans printed, in kidnap-cutout font, on plastic grocery-store bags. 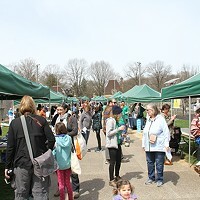 The ideas of reuse and self-governed living are all there, and of particular interest in a post-Tea Party America, where "self-reliance" means nothing more than "don't give poor people my money." Even so, Temporary Services' presentation is so anarchic that its content is too easily dismissed as ill-formed or unfinished. No such problem for subRosa, the collective headed by Pittsburgh's Hyla Willis and Providence's Faith Wilding. Their "Feminist Matter(s): Propositions and Undoings" explores feminism and collectivity as ways of approaching scientific research. A series of small tea tables, provocatively capped with mosquito netting, combine the academic language that so many of these artists use with an aesthetic approach. Small installations sit upon each table, evoking laboratory work while espousing the history of specific women, from anarchist painter Remedios Varo to geneticist Barbara McClintock. In the piece's central influence, Virginia Woolf's "Thoughts on Peace in an Air Raid," the artists find a fatal flaw that war shares with contemporary scientific work: "We must create more honourable activities for those who try to conquer in themselves their fighting instinct." Through drawings and texts embedded in the tabletops, sculptural objects placed on top of them, and other multimedia means, subRosa imagines a scientific world in which research is conceived and conducted free of testosterone bullying. It is hopeful in its ideas and, importantly, created with an eye to aesthetic value. Aesthetics are of great importance to Justseeds, the Pittsburgh-based national collective of 26 printmakers. Their contribution, a crowded landscape of small-scale billboards promoting tolerance of immigration and a reform of deportation policies, speaks to American audiences on a gut level: advertising. Justseeds' artists reference circus ads and Maxo Vanka's murals, Edvard Munch and Americana (in the form of a razor-wire-covered Cracker Barrel-shop "Welcome" mat) in their indictment of the border and immigration policies of the United States. That they sometimes do so with the same base sloganeering as their political opposites is tempered by the often beautiful, always skillful work Justseeds provides. It shows that while ideas and transformations can guide a collaborative artwork, the presentation of those ideas -- the aesthetics, the emotional punch of a fiery painting or a calm, subtle, installation like subRosa's -- are still its heart.